Firefox Focus is Mozilla’s privacy-focused browser for Android and iOS. It key feature is that it blocks all sorts of online tracking, including targeted third-party advertising, to protect user privacy. That has the beneficial side-effect of also improving the browser’s speed. Focus also automatically deletes the user's search history when the application is closed. Today, Mozilla's announced that it's added more features to its mobile-only browser, with the main benefits for Android users. The headline feature is the addition of what it's dubbed 'Enhanced Tracking Protection'. This feature's already available on the desktop version of Firefox, and allows users to decide which publishers they want to share their personal data with. The second addition to the Android app is the integration of Google’s Safe Browsing tool. This feature checks URLs for dubious activity like malware and phishing links. 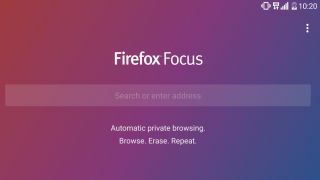 When a fraudulent site has been identified, the tool will display an alert on Firefox Focus which the user can choose to either ignore or follow. The list of shady sites is constantly updated by Google. While the aforementioned features have so far only come to the Android version of Focus, iOS users haven't been completely left out – a new version for Apple's mobile OS has gained the search suggestion feature that was originally added to the Android app in October 2018. This feature is turned off by default, but users who wish to enable the feature will need to keep in mind that their search history will likely be shared with Google.